I was out on the Feather today after checking the weather report on some clouds and possible rain. The weather was a lie. I was almost skunked for the day until I caught a small trout on some awesome technical midge dry fly fishing. No steelhead were caught today but the trip really got me thinking. Fly fishermen chase steelhead when the salmon arrive. While everyone else is out trying to catch salmon we fly fishermen are behind them swinging and nymphing for steelhead. Why would anyone want to chase steelhead when you have a bigger, more powerful, and readily available fish? Here are some reasons why fly anglers chase steelhead rather than salmon. 1. Steelhead are actually eating. Steelhead feed on bugs, fry, and salmon eggs as they migrate upstream. 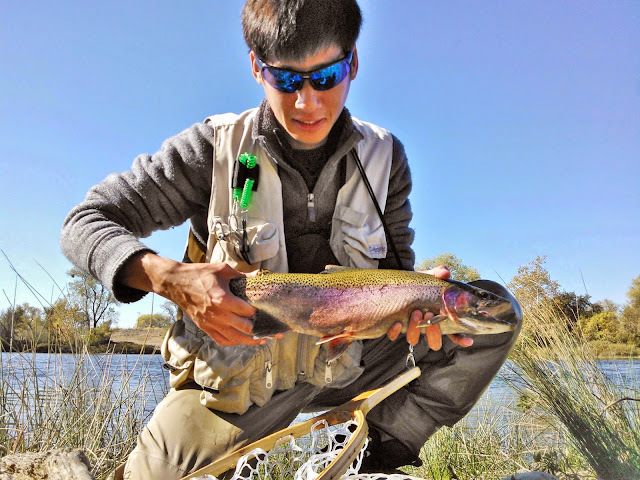 There is no snagging or flossing a steelhead, when a fish takes you can feel the grab. Salmon don't eat and they will only legally take if you manage to piss them off which can be a difficult task if your fighting crowds. My estimate is that for every 25 salmon there is 1 steelhead. Steelhead are very elusive creatures and if you've never caught one you'd probably never even notice they were there. They are extremely wary of their surroundings and if your having a fun time slipping on rocks in the water they'll know it. A friend of mine likes to say that even in a drought salmon will come up to spawn making them a dumb fish. He states that steelhead are smart because they are more dependent on the correct weather to move up. No rain, no steelhead. Although steelhead aren't too picky about their fly selection they'll often prefer one fly over the other. Also prepare to wade through the freezing cold water, fight your way through the sharp thorn bushes, brave the storms, and tumble down a few times to the prime access points. Steelhead are the ultimate test to an anglers dedication and patience. Put on your A-game because this isn't going to be easy. 3. Steelhead are hard fighting. Although salmon pull the hardest and fight like a tank, steelhead pull the furthest and fight like a jet. Once a steelhead gets airborne you better lower your rod tip asap or else "boink!" that hook is going to be shooting out right back at you. I've never had so many big fish throw my hook. You cannot simply haul them in, you need to be patient and play the fish fighting game. If you do manage to land one you just beat the best of the best and will be rewarded with one of nature's most beautiful fish. 4. Steelhead don't die after they spawn. One of the gifts of catching and releasing a steelhead is knowing that they will return again another day, bigger, stronger, and smarter. It is quite the feeling after you release your first steelhead. After a hard fought battle you pick up the fish and gaze upon that spotted back and see the reflection of that red stripe for the first time. You start to think about the long and dangerous journey that this fish has taken. A venture that only you can end or continue. As you begin to resuscitate the fish back and forth, finally you feel that last push away. You watch as the fish continues its imprinted quest into the unknown that awaits it. Before I caught my first steelhead I would literally have dreams of catching one. I must have logged in over 70 hours on my steelhead report card before I hooked my first and damn was that an amazing experience. I understand how to fish for them now and since have caught them on a regular basis. I respect steelhead as the ultimate fish for a fly angler to chase. Fish on.